The second one features better zooming. The Apple iPhone 7 Plus is showing off with two main cameras and a powerful processor. All of this is sitting inside a water and dust resistant case with two new colors. You also get stereo speakers, but the analog headphone jack has been removed. So, is the iPhone 7 Plus the iPhone to buy right now? If you can deal with the size of the phone – not to mention the price tag – it certainly betters its smaller sibling in almost every area, including screen, sound, battery life and camera. Apple announced iPhone 7 and iPhone 7 Plus in RED Special Edition and went on sale worldwide last Friday, in recognition of more than 10 years of partnership between Apple and (RED). This gives customers a remarkable way to share to the Global Fund which will bring the world a step closer to an AIDS-free generation. Here are four reasons why this red iPhone 7 Plus is not hard to love. Our iPhone 7 Plus review rates the iPhone 7 Plus for design, features, camera, screen, tech specs and value for money. Is the iPhone 7 Plus worth the price tag, and should you upgrade from another handset to Apple's most expensive iPhone yet? The camera has always been one of the iPhone’s greatest weapons against the encroaching army of rapidly improving Android handsets, and the substantial upgrade Apple has squeezed into the iPhone 7 Plus makes it a no-brainer for mobile photographers. 90% iPhone 7 Plus Review: Is It Good for Business? The iPhone 7 Plus is nearly everything you could want in a business phone. It boasts a roomy display, speedy performance and long battery life, so you can keep on multitasking well after the end of the workday. Strong security features and excellent videoconferencing capabilities round out the package. Plus, this is just a gorgeous piece of technology that's a pleasure to use. There's a simple question this year: Are the iPhone 7's new features worth the headphone jack hassle? Especially right now, when there aren't many Lightning headphones available and Bluetooth devices are still divisive. (RED)’s critical work provides access to life-saving HIV/AIDS programs in sub-Saharan Africa, which is home to more than two-thirds of the world’s HIV-positive population. One hundred percent of all money raised by (RED) goes directly to Global Fund HIV/AIDS grants that provide testing, counseling, treatment and prevention programs with a specific focus on eliminating transmission of the virus from moms to their babies. Since it was founded in 2006, (RED) has generated more than $465 million for the Global Fund, with more than $130 million from Apple alone. However, as we've always said of the Plus range, it's a big and heavy device that will divide opinion because of its wide body. Equally, it's an incredibly well-built device that won't disappoint - especially on the power and battery life fronts - because you'll be hard pushed to find a smartphone as capable and well-rounded elsewhere. The Apple iPhone 7 Plus is available from the first link below on various terms according to the amount of data etc. but the one that stood out to me is highlighted in the link £47 a month (£50 upfront) on a 24 month contract 6GB of data, unlimited calls, unlimited texts and 500MB roaming data. More RAM, a bigger battery and a serious impressive dual-camera setup makes the iPhone 7 Plus a much better purchase than the standard model - assuming you have no issue with the increased cost and larger size. The iPhone 7 Plus is probably the least innovative product that Apple has ever released, after all, it's a little slow on the features that other smartphone brands has done before, but they did it quite solidly, if not perhaps even better. Things that I like about the device is the new haptic home button, the convenient telephoto lens, along with the great picture quality and video recording, and the excellent durable battery life. The Apple iPhone 7 Plus is a best-seller from its very first day. Today, a few months after its launch, the phone is still on back-order, so Apple surely has got something right. Our tests proved it's not just marketing that's driving these sales, but the company's marketing prowess is undeniable. If you can live without a headphone jack, this is a great upgrade from an iPhone 6 or iPhone 6 Plus. If you already own a 6S Plus then the differences aren’t so pronounced. I’d wait to see what Apple has planned for the 10-year anniversary of the iPhone in 2017 in that case. Should you buy it? This is a great phone with some potentially-significant issues. The lack of headphone jack is a retrograde step and weeks of living with the ‘Taptic’ feedback that has replaced it have demonstrated that it’s far less useful than a simple 3.5mm port. The camera here is very good but not great. If you have longed for a phone with a zoom, now you’ve got a decent one but we’ve not really heard the market crying out for this feature. Also, Siri now makes the whole phone feel a bit more out of date than it should do – it needs an upgrade quick smart as she’s dragging the cutting-edge technology feel of the phone down. Also, why is Apple releasing a feature in Portrait Mode before its ready? Apple is all about fastidious/autistic attention to detail, not releasing a half-baked mess. If you can live with the, compared to some rivals, slightly lower levels of image detail, the only thing that could potentially hold you back is the Apple's rather steep price point of $769 for the 32GB base version. However, given the dual-cam's advantages, many users might find the premium over the competition to me more than acceptable. An important leap forward for Apple smartphones, but the Plus-sized model still isn’t for everyone. A worthy upgrade from the iPhone 6 or earlier, but not so much if you still have last year’s model. iPhone 7 Plus Hands-On Review After a Week! The new Apple iPhone 7 Plus pack a tech spec of Apple A10 Fusion quad-core 2.23 GHz CPU processor with 3 GB RAM. The device comes in 32/128/256 GB internal storage and a 5.5-inch LED-backlit IPS LCD (1080 x 1920 pixels, 401 ppi) display. It has a new 12MP rear camera and supports Wifi, NFC, GPS, 3G and 4G LTE. It packs in a Non-removable Li-Ion 2900 mAh battery. So we managed to use the device for about a week, and here's our thoughts on the iPhone 7 and iPhone 7 Plus. Check out the video below for more information! While the design might not have altered a great deal, it's clear that some big strides are made with this year's iPhones. Waterproofing is a huge plus point, and the traditional increase in processing power once again puts Apple at the front of the pack. Improvements with the camera and screen give further incentive for existing iPhone users to upgrade, and while the removal of the 3.5mm headphone socket is a pain, the expanded taptic engine does much to make up for it, allowing system-wide vibration feedback which can be felt in everything from scrolling menus to games. So here’s how this review ends: grudgingly. I wish Apple would have shipped the 7 Plus with better image quality, with details in good and low light to match or better the Galaxy S7’s. Perhaps it could have shipped the 7 Plus with a single, but improved camera, with a larger sensor for fuller details and less image noise. The iPhone 7 Plus, meanwhile, is an even better deal if you don't mind the bulk and size. It is also a phone that will give you better battery life compared to the iPhone 7 and will let you click better images, and more up-close, images with its second camera. The Apple iPhone 7 Plus is the ace. It has an excellent camera, offers the best performance that a smartphone can right now, and even delivers decent battery life. It still looks mostly like an old iPhone, the new Home button can take a while to get used to, and the smartphone is not the most ergonomic. Apple's iPhone 7 Plus brings a solid hardware upgrade over its predecessor but fails to impress with substantial improvements in design or looks. Is that an issue? It depends on how you look at it. The iPhones have always had nice designs that age well, and we've already gotten well used to the extra bezels around the display. But the counter argument that is also true - the manufacturers in similar or lower price points are pushing the envelope of what a regular smartphone can look like. In comparison, Apple doesn't seem to put much effort for such an expensive product. I believe Apple’s agenda with the iPhone 7 line is to lay the foundation for the iPhone 8, a handset that has the potential to generate the same sort of excitement Apple enjoyed when the redesigned iPhone 6 series landed in 2014. Jumping back to present-day, the iPhone 7 Plus is without a doubt the best iPhone to date as it relates to design aesthetics, features, and performance, but that doesn’t mean you should go out and grab one ASAP. Again, it’s a top-tier smartphone but unless your iPhone 6 or newer becomes lost, stolen or broken, Apple hasn’t presented a compelling enough reason to warrant an upgrade. All this being said, you can’t deny that this is a great smartphone, and probably the most pleasant experience that I’ve had with an iPhone in a while, and notice I say iPhone. If you value a great experience for consuming content, insane battery life, a robust ecosystem, great customer service, and one of the best cameras in the industry, then I do recommend getting the iPhone 7 Plus. It truly is the best iPhone you can buy, and I know that actually means something for many people around the world that are already invested in the Apple ecosystem. Although this initial review is supposed to be just the basics, over the course of the review we’ve learned quite a bit about the iPhone 7 and 7 Plus. These findings aren’t necessarily going to excite those that are interested in the deep-dive aspects that we’ve come to expect from a review – and for you we have a seperate deep-dive to come – but for someone that wants to know whether this phone is worth buying this should be enough to arrive at a decision one way or another. If you really care about the camera, then the iPhone 7 Plus is totally worth it. If you really care about that headphone jack, or your the type to only buy an iPhone when there are major design changes, maybe this isn't the phone for you. Both handsets have impressive hardware. The Snapdragon 821 represents the top of the Android tree at the time of writing, and Apple's A10 Fusion processor does the same. Screen-sizes are equal, but the Pixel XL just edges it with a QHD resolution. Google has really shouted about its new camera hardware, but we're sceptical that it can better Apple's dual assault. To sum up: The iPhone 7 doesn't break dramatic new ground in the looks department - aside from the arrival of jet black - but delivers real improvements under the hood in the areas users can most appreciate - especially with the new camera setup in the iPhone 7 Plus. The iPhone 7 doesn't break dramatic new ground in the looks department - aside from the arrival of jet black - but delivers real improvements under the hood in the areas users can most appreciate - especially with the new camera setup in the iPhone 7 Plus. If you like the iPhone and are already in Apple's ecosystem, you can't go wrong with the iPhone 7 or 7 Plus as an upgrade; if you're new to the iPhone, you couldn't have picked a better time to switch. Overall, the iPhone 7 Plus continues to deliver what Apple has always done: impressive hardware matched perfectly to software, with an excellent camera to boot. Yet this year, the company has gone somewhat further than we might have expected – especially with the spectre of that 10th anniversary edition next year looming – while also keeping some things almost identical. The iPhone 7 Plus has plenty to be pleased about - waterproofing, a twin-lens camera, a specs bump, stereo audio, a customisable Home button - but is there anything here to get passionate about? This is quite clearly the best iPhone yet, with a lovely design and an impressive feature set and user experience, but the price is steep. Unless you're particularly in love with big screens or the very latest in camera features, the iPhone 7 may be a better and better-value option. Unfortunately though, the iPhone remains a relatively slow charger next to QuickCharge-enabled rivals. The standard bundled charger is a paltry 5V/1A brick, and charging from a 2A plug does little to boost charge speeds. Slower charges are better for the lifespan of the battery; they're also pretty frustrating when you're used to plugging in a dead phone for 30 minutes and being well past 50 percent. The iPhone 7 Plus will tick a lot of boxes for many iPhone buyers. It lasts a day per charge, it has dual cameras on the back, it has a larger screen and has most of the good things about the iPhone 7 including IP67 waterproofing. But it’s not a great phablet compared to the competition. Ultimately, though, the iPhone 7 Plus is evidence of an Apple that's not afraid to take risks, to change things up in the goal of further perfecting its best-equipped smartphone option. And while some of those changes are touched by controversy, and others feel like they haven't quite realized their full potential, the iPhone 7 Plus dares to take Apple's smartphones to a fascinating new place – and we can't wait to see where this drive to innovate brings the company next. I have to say I was very impressed with the battery life, which keeps pace with the Apple Watch throughout the day despite having larger screen. If you have an iPhone 6 Plus, then it makes sense to upgrade to the iPhone 7 Plus as there’s a significant upgrade between the two. However, if you’re coming from an iPhone 6S Plus, the iPhone 7 Plus might not be a huge deal. If you’re a first time iPhone user and you have the money, the iPhone 7 Plus is a good option. If you’re on a tight budget, the iPhone 6S Plus with it’s reduced retail price (only Php25,800 here) and iOS 10 update is still a much better option. The outstanding, beautiful and aggressively pared-down – perhaps overly so – iPhone 7 Plus is available now, starting at $769 (full retail) with 32 GB storage. For more, you can read our review of the smaller 4.7-inch iPhone 7. I’ve never been convinced as to how durable Apple’s propriety connector is for charging – let alone when using a set of headphones. Make no mistake, the 7 Plus feels much like an iterative update, and had the otherwise excellent Samsung Galaxy Note 7 not revealed itself as a potentially explosive device, that would probably – for me – be the more impressive of the two. Nevertheless, with a set of sensible new features, this is very much the phone I would currently recommend above all others. It's heartening to see that both phones are fairly evenly matched in terms of specifications. The iPhone 7 Plus takes the lead in terms of the processor and, while the Galaxy's snapper is good, it can't compete with Apple's dual-camera set-up. However, the Galaxy S7 Edge annihilates the Plus in the screen stakes, and has a bigger battery (with fast charging attributes) and a microSD slot. 100% iPhone 7 Plus review: who needs a headphone port when you've got this camera? The ability to get up close and personal with the subject of your snaps without compromising on quality is something smartphones have been sorely missing for years and the effortless elegance with which Apple has introduced it makes the 7 Plus an must have. The only question on whether you should buy one or not is if you can pocket it, both in terms of size and cost. So far that’s it! Watch this space for our full review of the iPhone 7 Plus in a few days. We’ll be putting this through our usual stress tests and we’ll be putting a lot of energy and focus on the camera capabilities since that was Apple’s main selling point. These leaks and predictions will be settled once the new iPhones are launched and released. With months away from the launching date, people can’t contain their excitement. After all, only time will tell whether iPhone 7 and iPhone 7 Plus will meet everyone’s expectations. iPhone 7 Plus vs Galaxy Note 7: Apple and Samsung's flagship phones head to head. Which is best? Both of these are top-notch phones. Each has its advantages and the best one for you will depend on whether you're already allied to Android or iOS. If you're not, the Note 7 offers a little more freedom while the iPhone 7 Plus is more locked down. It's early days for comparing performance but it's safe to say both are powerful phones. The Note 7 is marginally cheaper, has a headphone jack and a bigger screen (with multi-window and the S-Pen), but the iPhone looks to have the advantage in the camera department and, in our opinion, the better software. The iPhone 7 Plus probably isn’t the smartphone you were waiting for, but it is the phone we were expecting. Don’t be put off by the unchanged design, we think it’s still the most attractive smartphone on the market, as well as being the easiest to use. Your expensive smartphone will now survive a splash, and the battery can stand up to a whole day’s use. Pair that with the faster-than-light A10 Fusion processor, dual camera, and more storage, and you’ve got a smartphone worthy of the new number in its name. Of course, it’s not perfect. The screen resolution lags behind its competitors, and despite having a smaller screen than the Note 7, overall dimensions are larger. If you’re looking for a new iPhone, you should buy the iPhone 7 Plus. Although the iPhone 7 Plus isn’t a huge upgrade over the iPhone 6S Plus, Apple took a few radical steps – some good, some bad. The dual-camera tech and its optical zoom are excellent, for example. It’s a bold move for Apple, and although it’s not the first company to bust out dual cameras, Apple has really refined the tech and made it useful, gimmicky bokeh effects aside. iOS 10 is the best version of the operating system yet, and it runs best on an iPhone 7 Plus. Adding water resistance is a smart move too; Samsung and many others were here first, but it’s still a great feature. The larger battery is another strong selling point for the iPhone 7 Plus. If you're an iPhone person on schedule for an upgrade, go ahead and do it. Heck, you're probably not even paying that much attention to reviews since you're already sold on the iPhone and iOS and are simply ready to move to the latest model. For those who are also considering their Android options and have a fondness for iOS, these are very enjoyable phones that generally just work fast and well. Given Apple's past track record, they should stay fast and responsive and have top quality apps with occasionally more polish than their Android counterparts. You won't get the customizability and design variations that you will with Android's many brands and models to choose from, but you already knew that since it's an old story. An all-too-familiar design and desperately slow charging times are two things we didn't quite like about the iPhone 7 family. The lack of an audio jack is also worth mentioning here, though we don't think that it will be a deal-breaker for Apple loyalists. So, should you upgrade to the iPhone 7 or iPhone 7 Plus? Well, it depends. So all looks good for iPhone fans but before you rush out to buy one there are some negatives to owning this phone. If you're ready for an upgrade, but can't decide between the iPhone 7 and the iPhone 7 Plus, our vote is for the Plus. In our opinion, the camera features make it more appealing than those on the iPhone 7. But, of course, you need to consider whether you need your phone to be pocketable and easy-to-hold, or if you prefer the bigger display. We say go big or wait for the next upgrade. Last but not least, performance of the iPhone 7 Plus is what you’d expect from Apple’s latest and greatest A10 Fusion processor. Thus far I’ve never once gotten the 7 Plus to stutter, even heavily multitasking, playing demanding games, or making video calls. The phone never crashed and handled everything I could throw at it. I never felt that the iPhone 6s or 6s Plus was slow, but the iPhone 7 and 7 Plus are just a bit faster. Opening apps – especially games – will be a tick faster, but you’re unlikely to notice the performance gain in day-to-day use. Some Apple critics have described the iPhone 7 Plus as boring or lacking creativity. If that’s the case, you could say the same about every new phone in 2016. Putting the camera aside, it’s a steady-as-she-goes upgrade. You should get at least two years of value from the iPhone 7 Plus. It won’t look tired or jaded in 2018. And it has been revealed that the device's dual snapper actually comes as a single module which resides in an slightly larger exterior nook, likely to help avoid water damage and dust problems. According to the iFixit team, both cameras now include a new image sensor that is claimed to be 60% faster and 30% more energy efficient than previous iPhones. 90% Apple iPhone 7 and 7 Plus review: Big upgrades, but where's the next big thing? If you need to buy a new phone right now, the iPhone 7 and 7 Plus are excellent. They're the best iPhones Apple has ever made. But if you decide to wait for next year, you won't actually be missing out on much. Don't get me wrong, Apple needed to make the iPhone 7. They needed to go back to basics and improve the fundamentals by adding features like water resistance and stereo speakers - features that their rivals have been pushing for years. And now that they've done that, Apple is ready to build on that foundation and change everything again. But we'll have to wait for next year's iPhone to experience that. As you may be able to tell, I’m pretty impressed with the enhancements Apple has made to the iPhone 7 and 7 Plus, and it’s only been about a day. Did you get your hands on an iPhone 7 or 7 Plus yet or have an opinion on the changes Apple has made? Let us know in the comments! And be sure to stay tuned to Gear Diary, where we’ll be covering the iPhone 7 and 7 Plus extensively, including accessories, apps, and more. The iPhone 7 Plus has the biggest batteries of all of Apple's phones. It has an incredible screen and force-touch comes into its own on the large amount of real estate you get on the handset. Apple have finally listened to fans and consumers and made the 7 duo dust and water resistant. There is finally a dual lens camera onboard and 4K video recording...However, the phone looks exactly the same as it did three years back, yes there are speaker grilles instead of the headphone jack at the bottom, but the footprint has reamined the same and with prices an eye-watering £150 more than the version a year back, it might not be enough to convince even the mose die-hard Apple fanboy to trade-up. The water resistant design is also going to please anyone who has buttery fingers and the new stereo speakers bring a much-improved audio experience. So all looks good for iPhone fans but before you rush out to buy one there are some negatives to owning this phone. It's worth noting that StarHub and Singtel slightly adjusted the upfront cost of the phone in some of its plans (as compared to the previous iPhone launch). While M1 may be pricier by Singtel by a dollar in some tiers, we've also considered the extra data given by M1, since we assumed each extra GB of data used is ~S$10.70/month if its purchased as a standalone add-on. With that in mind, paying an extra dollar over two years works itself out. But it’s also significantly more expensive than the iPhone 7, and thanks to the weakness of the pound versus this time last year, the iPhone 7 Plus also works out significantly more pricey than the iPhone 6 Plus was when it launched. You do get double the storage, with the base model now offering 32GB instead of 16GB, but with prices starting at £719, it’s now £100 more expensive than in 2015. Ouch. 80% iPhone 7 Plus review: Is it the best performing phone ever made? In some ways the iPhone 7 Plus feels like an intermediate release, a phone that’s paving the way for something else. Apple often introduces new technologies that will ultimately be used in long-planned new features – for example, Touch ID was introduced along with the secure enclave on the processor well before the release of Apple Pay, which is what it was designed from the outset to support. Many of the new features in this phone feel like that: things we’re not yet getting the most use of, but which will be important in the future. Almost everything about this phone has changed. It’s faster, the cameras are better, it’s water-resistant, there’s more memory, it has a dinky new home button. Yet still, despite loving it, I’m not left with the immediate need to run out and order one, as I usually do (don’t worry, Apple, I probably will anyway). Sure, it loses out on paper in a head-to-head with Samsung’s Galaxy Note 7, which has a stylus and a better display for less cash , but if you’re firmly entrenched in camp iOS, it’s time to go big or go home. The iPhone 7’s camera might be improved, but the iPhone 7 Plus’ snapper offers a lot more to play with. So unless you're totally against big screens, this is the iPhone you should buy. So, no, the iPhone 7 won’t blow your mind with its design or features. It’s still a fantastic phone. And philosophically, it feels like Apple is throwing open a door. The iPhone 7 might not be a revolution, but it might be the catalyst for lots of them. Your phone will be better in a few months, and even better a few months after that. And wouldn’t that be exciting? In almost any other case, on almost any other phone, the loss of the headphone jack would be a deal-breaker, even with the excellent changes to other parts of the phone. But this is the iPhone, and with iOS, Apple has built an overall ecosystem that's hard to leave. So potential buyers have to think, first and foremost, about whether it will be more annoying to switch over to an Android phone with a port, or to have to use an adaptor on planes and in cars over the next few years. For some, the loss of the headphone jack may make it feel like Apple made the iPhone actively worse. The iPhone 7 Plus has a bigger, sharper screen than the iPhone 7 and will tend to last about an hour longer when browsing the internet or watching videos (that gap has shrunk since the last generation - the 6s Plus last between one and three hours longer than the 6s in these usage scenarios). The iPhone 7 weighs less (138g to the 7 Plus's 188g) and fits into a pocket more easily, and costs £120 less at each storage tier. And then the iPhone 7 Plus gets the bonus feature of a twin-lens rear-facing camera, which enables 2x optical zoom and features such as post-shot refocusing. I don't like the shape of the 7 Plus. I want something more compact, handheld, like the much more svelte Samsung Galaxy S7 Edge, which has an identically sized screen. Next year, Apple might get there, and maybe even use a curved screen. Maybe I'd wait. The 7 Plus has superior features...but I want a different design so I can shoot photos more easily. It's cumbersome to hold. Apple broke with its tradition by keeping the 6/6s design for another year, opting instead to improve fundamental parts of the user experience. The iPhone 7 has a better battery than before, a more color-rich screen, a vastly improved camera and plenty of horsepower thanks to its new A10 Fusion chipset. If you're looking for newfangled features (or a headphone jack, for that matter), you'll have to search elsewhere. While it's not thrilling enough to warrant an immediate upgrade from last year's 6s, the iPhone 7 is nonetheless an excellent smartphone. The loss of the headphone jack is clearly a negative. Whether or not it’s a revolutionary, forward-thinking decision will be clearer over the years is yet to be seen. But, in 2016, it’s going to cause many potential iPhone owners a lot of hassle. Not least because they’ll have to contend with buying more accessories (if they lose the $9 converter or fancy charging and listening to music at the same time), but also how much more cumbersome extra gear makes the iPhone 7 Plus. For most, the choice between the iPhone 7 and iPhone 7 Plus will come down to screen size. How big do you want to go? But with the iPhone 7 and 7 Plus, your camera demands should also come into play, with the Plus promising a more professional camera-phone experience. What’s the difference between the new iPhones? The iPhone 7 and 7 Plus are evolutions of the previous two generations. They add waterproofing, new colour options, a brighter screen, better cameras and a faster processor. The removal of the headphone jack is a brave move, but a Lightning adaptor is included in the box. Which one is best? That will depend on your budget and whether you prefer a smaller or larger phone. Unlike the iPhone 7, where you could be forgiven for it being a rather lukewarm upgrade, the iPhone 7 Plus is a very big jump over the iPhone 6S Plus launched in 2015. For your money, you're going to get the tweaked design, the option of new colours, the stereo speakers, the new Home button, bigger storage options up to 256GB, and that new dual-camera system. Like we mentioned at the start, this year’s new iPhones are not drastically different from last year’s, but they do have some important features that will entice users to upgrade. The faster processor and better cameras are perhaps the most attractive new features. iPhone fans who have been hankering for a proper black iPhone will also feel the urge or need to upgrade, especially since the new Jet Black color looks so cool. That said, it will be interesting to see how users react to Apple’s bold decision to remove the 3.5mm audio jack. 90% Es gibt viel zu erzählen, wo fangen wir an? Apple iPhone 7 Plus im Test: Nur eine Weiterentwicklung? Positive: Support waterproof; dual camera. Negative: No audio jack. Positive: Excellent design; high speed system; large screen; good display; long battery life; good speakers; waterproof and dust avoiding. Negative: Very large size; unsupport fast and wireless charging; high price. Positive: High performance; excellent cameras; good display. Negative: High price; no headphone jack. Positive: Great built quality; high performance; powerful hardware. Negative: High price. Positive: Impressive jet black color; waterproof and dust avoiding; new home button; good speakers; quality performance; excellent cameras. Negative: No headphone jack. Positive: High performance; good autonomy; waterproof. Negative: Uncomfortable ergonomy; relatively high price; no headphone jack 3.5mm. Positive: Impressive black color; new waterproof technology; new home button; good speakers; quality performance; very good cameras. Negative: No headphone jack 3.5mm. Positive: Powerful hardware; good cameras; long battery life; waterproof. Negative: High price. Positive: Good cameras; excellent performance; long battery life. Positive: Watperproof; high performance; decent cameras. Negative: No audio jack; old design; relatively high price. Review: iPhone 7 (Plus) - Is goed ook goed genoeg? Positive: Excellent cameras; good display. Negative: No audio jack; high price. 90% Notre test & avis sur l’iPhone 7 Plus : faut-il l’acheter ? iPhone 7 Plus : est-il plus doué que les autres en photo ? 83% Apple iPhone 7 Plus'ı A'dan Z'ye inceledik! Positive: Large screen; support waterproof IP67; dual camera; high performance; decent speakers. Negative: No headphone jack. Positive: Excellent cameras; beautiful design; quality display; powerful hardware; long battery life. Negative: High price; no audio jack. Positive: Support waterproof IP67; good cameras; decent speakers. Negative: Ordinary design; slippery case; no headphone jack; sim and microSD are on the same slot; mediocre autonomy; slow charging; high price. Positive: High performance; support dual camera; waterproof and dust avoiding; high quality screen with 3D Touch. Negative: No extended memory card slot; no 3.5mm audio jack; difficult using by one hand; high price. Positive: High performance; solid workmanship; high quality touch screen; good speakers. Negative: High price; short battery life; no rewind button; no headphone jack; no wireless charging. So sánh nhanh Galaxy S7 hồng, iPhone 7 Plus hồng: Ai nữ tính hơn? Positive: Impressive color; beautiful design. Negative: High price. Positive: Impressive color. Negative: High price. Positive: Support waterproof; powerful hardware; high performance; good cameras. Negative: No headphone jack; high price. Positive: Excellent cameras; powerful hardware; high performance; long battery life; very good display. Negative: Relatively big and heavy; high price; no headphone jack. Positive: Excellent dual cameras. Negative: High price. Positive: High quality wireless sound system; flexible bluetooth connection. Negative: Inconvenient lightning jack. Positive: Waterproof and dust avoiding; good performance; excellent cameras. Negative: Short battery life; requires adapter for headphone. Positive: Long battery life; excellent speakers; support waterproof. Negative: High price; large size; slow charge. Positive: Nice design; high autonomy. Negative: High price; poor display. Positive: Powerful hardware; high performance; excellent cameras. Negative: No headphone jack; uncomfortable home button. The Apple iPhone 7 Plus is the latest Apple smartphone and was released in September 2016. Apple smartphones are known to be high-end with high performing hardware specifications and the iPhone 7 Plus is no exception. Since it is IP67 certified, it is quite tough and dust and water resistant – the first for any Apple device. Compared to the Samsung Galaxy S7 released recently, which is IP68 certified, they are both equally dust resistant. The only difference between them is that the Apple iPhone 7 Plus can be underwater in a depth of up to 1 m for 30 minutes, while the Samsung Galaxy S7 can be underwater in a depth of up to 1.5 m for 30 minutes. However, it is not recommended to use the IP6x certified smartphones submerged because water resistance is not a permanent condition. The Apple iPhone 7 Plus measures at 158.2 x 77.9 x 7.3 mm (6.23 x 3.07 x 0.29 in) and weighs at 188 g (6.63 oz). It looks pretty much the same as the older iPhone 6s Plus, but the antenna lines has moved from the centre to the top and bottom parts of the back side. The camera bump is also slightly different to fit that dual camera setup. It is a 5.5-inch screen display smartphone with approximately 66.7% screen-to-body ratio, while the iPhone 6 Plus had a screen-to-body ratio of 67.8%. The display built on the iPhone 7 Plus is a 5.5-inch Retina display with 16M colors and a resolution of 1080 x 1920 pixels. An ion-strengthened glass with an oleophobic coating provides a certain level of finger smudge resistance. 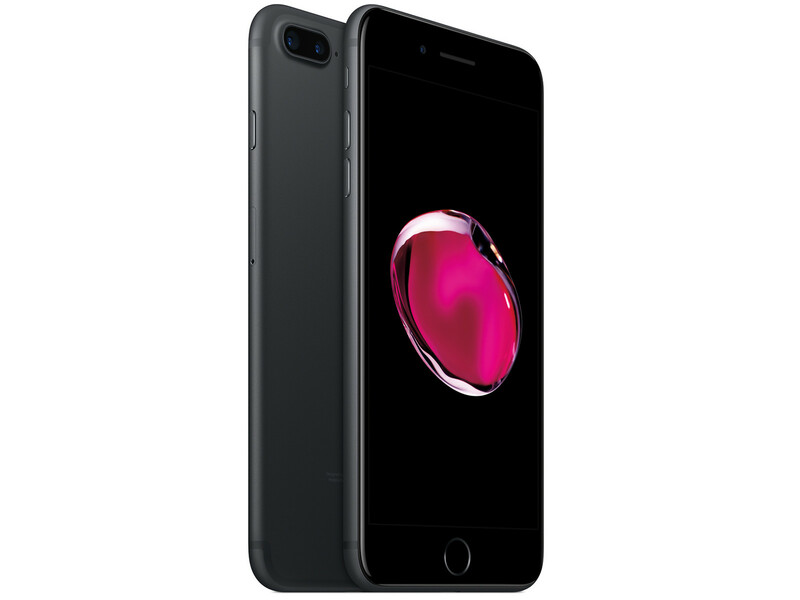 As for hardware specification, the iPhone 7 Plus features a 2.23 GHz quad core processor on Apple's A10 Fusion chipset with 64-bit architecture, 3 GB RAM and an embedded M10 motion co-processor. The embedded motion co-processor collects and processes data from integrated sensors such as accelerometer, gyrometer, proximity sensor, barometer, and compass, which eases the load of the main processor. It is one of the Apple customized parts only available on smartphones and tablets released by Apple. For the operating system, it runs on iOS 10.0.1 and is upgradable to iOS 10.0.2. Since the memory storage of the smartphone is not upgradable, Apple provides smartphones with different storage sizes ranging from 32 GB, 128 GB, and 256 GB. A 32 GB version of the iPhone 7 Plus would be sufficient for normal usage. This is an improvement from the iPhone 6 Plus with a smallest storage capacity of 16 GB, which is often insufficient. However, some reports have claimed that the 32 GB memory module on the iPhone is significantly slower than the 128 GB and 256 GB module. The iPhone 7 Plus has dual 12-MP cameras with a f/1.8 aperture on wide-angle and f/2.8 aperture on telephoto. It features optical zoom at 2x and digital zoom up to 10x. The camera is packed with features such as geo-tagging, optical image stabilization, touch focus, face/smile detection, HDR mode, quad-LED true tone flash and panorama up to 63 MP. It supports 4K video recording at 30 fps with 8-MP image capturing simultaneously. The battery of the iPhone 7 Plus is a non-removable Li-ion 2900 mAh battery, which is capable of delivering up to 384 hours stand-by, 21 hours talk time and 60 hours music play. Additional features include Siri natural commands and dictation and iCloud cloud storage service. The iPhone 7 released in September 2016 is considered one of the most expected phones all over the world. As one of the leaders in the smartphone market by making new technical trends, Apple conquered most customers with products which are appreciated with extremely high satisfaction. And, the iPhone 7 Plus is not an exception. Following most reviews from numerous pages, it is supposed please many users with improvements, such as: a dual-camera, new color configuration, more space for media and apps, longer battery life. Nevertheless, some small troubles exist. According to the page PhoneArena, both the iPhone 7 Plus and the iPhone 6s Plus share a lot of design elements in general, but the differences are arguably easy to spot. By far the most prominent change is the new camera bump on the handset’s rear. Although there is a slight drop in weight, from 192 g to 188 g (measuring 158.2 x 77.9 x 7.3 mm) following a review from page Tech Radar, the iPhone 7 Plus phablet has the same size as the 6s Plus that it is replacing. This page also remarked about the new feature which causes much less controversial: Being IP67 certified, the iPhone 7 Plus is both dust-proof and water-resistant. However, the page Phone Arena also advises users in case they want to take the phone with them into the pool, the manufacturer announced a warning that the protection may decrease over time and absolves itself for any duties to perform warranty service related to water damage. Beside 3 familiar colours: gold, silver and rose as usual, Apple added 2 new black shades: a low-key matte black and a glossy jet black. In my opinion, the iPhone 7 Plus looks exactly like the 6s Plus if you put the 7 Plus in a case and it is hard to distinguish them from far away. There is no significant difference in the design. According to page GSM Arena, the Apple iPhone 7 Plus phablet still has the same specifications in terms of size and resolution: a 5.5 -inch unit with a 1080 x 1920 pixel resolution and a pixel densitiy of 401 ppi. It features a LED-backlit IPS LCD screen with RGB matrix. However, the panel has been updated since the 6s Plus and 3D-Touch enabled. According to Phone Arena‘s display measurements, the iPhone 7 Plus‘s screen is brighter than Apple‘s specification. A maximum brightness north of 670 nits is excellent. Although size and resolution remained unchanged, Apple is delivering the same sorts of brightness and color enhancements as in the iPhone 7 according to a review from Phone Arena, while Tech Radar reports that the phone’s display is just slightly differnt: “There are more colours, so things look even better” and “apparently 25% brighter although it is not particularly noticeable”. Moreover, according to The Verge’s evaluation, the display is not as insane as the 2K or 4K OLED panels, which had been popping up on high-end Android phones, but it is a sharp, bright and beautiful LCD, which is great to look at. In my view, the 7 Plus still has a beautiful and pleasing display with a wider range of colors now. This phone is powered by new generation A10 Fusion chip, which featues a quad-core CPU with two high-performance cores running at 2.4 GHz and two power-saving ones. About the performance in general: “The iPhone 7 Plus is fast. Really fast. In a simple side by side comparison to iPhone 6s Plus, the 7 Plus is faster every time as we skipped between applications, fired-up multi-tasking and loaded games”, said the Tech Radar. According to GSM Arena, the high-performance cores run about 40% faster than the A9 generation and two-times faster than the A8 generation, while the new six-core GPU inside is 50% faster than the A9’s GPU. Also, Tech Radar has a great comment: “The 7 Plus performance is just all-around impressive!”. Nevertheless, if your purposes are just social networks, checking emails, web surfing, The Verge supposes that the iPhone 7 Plus has not been really all that much faster than the A9 chip in the 6s Plus. According to Phone Arena, the iPhone 7 Plus was benchmarked by the AnTuTu with 179811, which was considered the best benchmark of the mobile world at the time of this review. It beats all other high-end Android phones like the Samsung Galaxy S7 Edge or the LG G5 (as of November 2016). This phone also comes with 3 GB RAM instead of 2 GB RAM in iPhone 7. Eventually, we have to say that this is the beast in mobile performance at the moment. Running iOS 10, which redefined the lock and home screen, the notification and the control centers, the 3D touch experience, Siri and improved system applications, the Apple iPhone 7 Plus was upgraded drastically. According GSM Arena, messages were overhauled, stickers and new text effects, emoji galore and even a handwriting mode added. As an evaluation from GSM Arena about the software, “Apple has done a good job refining the interface and there are enough new features to enhance the user experience without complicating it. It is definitely moving forward”. Besides, The Verge seriously says that this has been the nicest iOS update in a long time, with a clear sense of how you should flow between operations and a much more inviting visual design. However, Tech Radar has stated: “Except those updates, everything is pretty much the same, and while you’ll certainly feel at home on the iPhone 7 Plus if you’re upgrading on the previous iPhone, the on-screen experience may not feel quite as new and exciting as you would hope”. Excluding that, iOS 10 is worth upgrading in any way. This phablet is equipped with a non-removable Lithium-Polymer battery rated at 2900 mAh, which is 5.5% beefier than the iPhone 6s Plus‘s. Thanks to a new energy efficient Apple A10 Fusion chip, the 7 Plus should offer a longer battery life than before. GSM Arena points out, “It can do about 18 hours of 3G calls, 13.5 hours of web browsing on a single charge and video watching for 8 hours. The standby endurance turned out way above average (13 days) and thus the very good endurance rating of 75 hours isn’t a surprise”. As for Tech Radar, this phone is considered to “comfortably lasts a full day on a single charge and it still requires a nightly charge to see you through a second day”. “Under heavier load, I get the sense that the battery life will be like the 6s models', but those extra hours that Apple has promised will be meaningful for those desperate moments on the way home from work”, confirmed The Verge. The Home button is the significant highlight in the iPhone 7 Plus, which is more different than you might think as it no longer moves at all, it is totally solid, as remarked by The Verge. Introducing the Taptic Engine, which provides vibration whenever you click on the Home button, The Verge has come with a conclusion about this: “It feels like the entire bottom of the phone is clicking”. And the Taptic Engine also provides feedback whenever you drop the notification down so that the phone will have a little bump. Furthermore, you can set the press feedback vibration in 3 levels, and it may take users some time to get used to this new button. Notwithstanding, GSM Arena showed a different view: “What’s worse here is the whole button does not work if you wearing gloves and the feedback is almost non-existent when you lay the phone down on a flat surface”. But in general, the Home button and the Taptic Engine work as well as Apple has advertised and it gives the perfect feedback, but users might need time getting used to it. In terms of connectivity, the iPhone 7 Plus no longer features a 3.5mm audio jack. Instead of the normal audio jack, Apple uses the lightning as a 3-in-1 port - one port only for three functions including charging, connecting and listening although charging is not faster as well. This seems a good signal for most technicians appreciate this improvement. GSM Arena thinks, “The bottom is less crowded than before because of the missing audio jack” or Phone Arena says, “Broad network compatibility gets even better with higher-speed support”. In addition, Apple has delivered a respectable upgrade, increasing the phone’s theoretical maximum LTE Advance Bandwidth from 300 to 450Mps. However, The Verge reports, “It is disappointing that Apple did not put more work into making the wireless audio a better overall experience on the iPhone 7 Plus”. Coming with dual-camera, the standard 12 MP camera with 1.8 focal length lens and 12 MP sensor with a whole new telephoto lens, Apple aims at portrait shooters (56 mm and 2.8 focal length lens) with Optical Image Stabilization (OIS), a new four-colour True-Tone Flash and a wider color capture. The front camera also receives an upgrade from 5 MP to 7 MP FaceTime. By providing better image quality under low-light condition, this camera allows user to zoom from 2x to 20x beside the exclusive portrait mode added for the iPhone 7 Plus (available for iOS from 10.1). This camera in the 7 Plus is actually appreciated highly, for instance, according to GSM Arena: “The camera is blazing fast. There is no pausing for loading or saving even when taking bursts of photos (even a hundred images or more)”, or according to Tech Radar, the phone has the “excellent point-and-shoot dual cameras, with much improved low-light performance and depth-of-field feature coming later in 2016”. In a camera test, Phone Arena evaluates the image quality and says, “With the combination of OIS and the faster shutter speeds that an f/1.8 aperture affords, it is easier than ever to snap clean, sharp pics that are free of unwanted motion blur”. In addition, this page also had a positive remark about the optical zoom of iPhone 7 Plus: “It sure opens an exciting chapter in that story. Spend enough time with camera on iPhone 7 Plus and you may find yourself unable to go back to iPhone 7 camera”. And GSM Arena comments, “Without a doubt this one of the finest front-facing cameras out there”. Furthermore, the video recording capability of this phone allows users to record 4K videos at 30 fps and Full HD videos at 30 fps and 60 fps. Slow-Motion videos can be recorded with 1080p resolution at 120 fps or with 720p resolution at 240 fps. For this function, GSM Arena says “The 1080p videos at 30 and 60 fps are among the best we’ve seen, well stabilized again, with great amount of detail, find colors, a steady framerate and superb dynamic range”. As a small conclusion for this section, I completely agree with a review from The Verge: “The iPhone camera is likely the best camera most people will ever own”. In conclusion, the iPhone 7 Plus is great, but not really excellent as expected. Honestly, this phone has no considerable change in the appearance or the designs as well, according to GSM Arena. However, there are many outstanding improvements from Apple for this phablet, including: water resistance, great display, better battery life, the good Taptic Engine, and the improvement of the cameras (dual cameras). The A10 Fusion chip also plays an important role for this phone to become one of the most powerful phones this year in the phablet range due to its powerful performance. Moreover, there are still some disadvantages existing in the 7 Plus, such as: inconvenience caused by the lack of a headphone jack, the easy scratches on Jet Black color or the immature wireless audio ecosystem. The dual camera features has not yet finished (updated November 2016). Last but not least, the price of this phone is also an issue: In my opinion, the price is unreasonable considering the value for the user as there are not many significant improvements in this product. Imagination A10 Fusion GPU: Multicore graphics card included in the Apple A10 Fusion SoC that can be found in the Apple iPhone 7 and 7 Plus smartphones. Most likely based on PowerVR technology and according to apple 40% faster than the A9 while using only 2/3 of the power. Non demanding games should be playable with these graphics cards. » Further information can be found in our Comparison of Mobile Graphics Cards and the corresponding Benchmark List. A10 Fusion: System on a chip (SoC) from Apple that is built into the iPhone 7 and iPhone 7 Plus. It integrates four 64 Bit cores that are divided in two clusters. Two high performance cores that should be around 40% faster than the A9 (according to Apple) and two low power cores (that need only 1/5 th of the energy in some use cases). Up to now its unclear if all four cores can be used at once.» Further information can be found in our Comparison of Mobile Processsors. 86.94%: This is a good rating above average. Nevertheless you should not forget, that 10-15% of all notebook-models get a better rating.